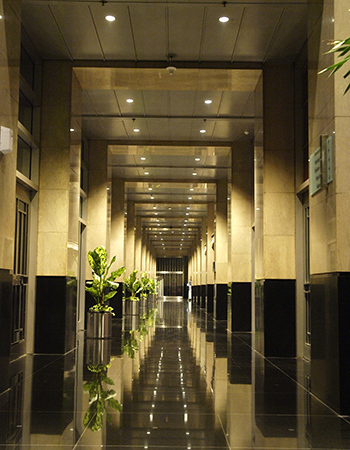 Our reputation for excellent building management contributes to our success. 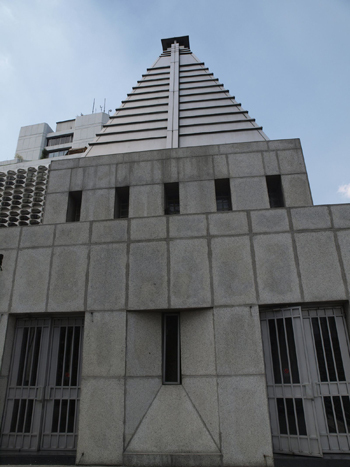 Graha CIMB Niaga– designed by world renowned architects Kohn Pederson Fox Associates (KPF), New York, is well known for its distinct architecture, reminiscent of the 20's and 30's. 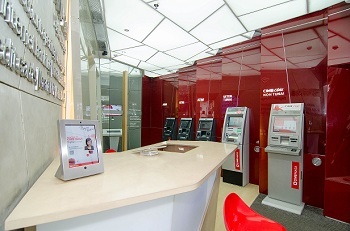 The innovative design and aesthetic merits has made Graha CIMB Niaga one of the most notable landmarks on Jalan Sudirman. 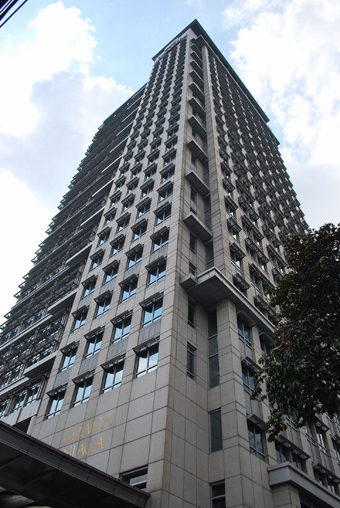 The 30 story building uses classical design with walls fitted with a stylish mix of imported granite, marble , stainless steel and aluminum all working together to render the building as majestic and luxurious. 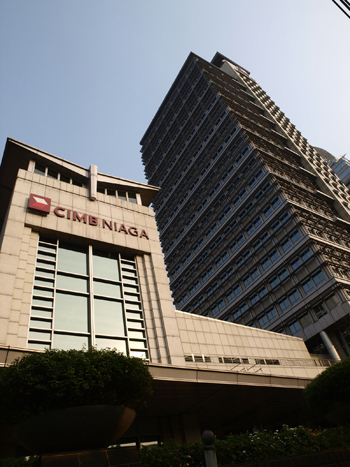 Graha CIMB Niaga is owned and managed by PT Grahaniaga Tatautama, established in 1993 and has since earned a reputation for outstanding attention to detail in every aspect of building management. The Management Team operates under a participative management philosophy with all staffin the company are encouraged to contribute to goal setting and produce innovative/creative problem solving in their area of work. We adopt a self managing teams to empowering and at the same time allowing them to be collectively accountable for the work done. Our motto is “Quality product and Service Excellence” which we implement through yearly surveys of all our valued buyers/tenants to ensure that we achieve our objectives. 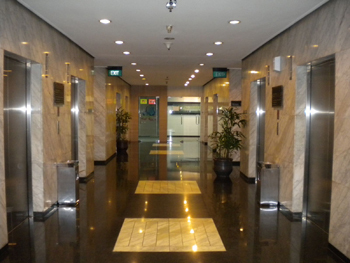 As testimony of our management style, we have been awarded many awards/certification and recognition from credible institution both local and international with recent certification from the Building and Construction Authority International (BCAI) of Singapore in 2015 for our achievement in getting the first Building Certification Platinum Standard for an existing building in Indonesia. PT Grahaniaga Tatautama has two subsidiary companies, namely PT Griyacanggu Tatautama which has a luxurious hotel/condotel in Bali and PT Nusa Sarana Pradipta which owns and operates the prestigious Financial Club Jakarta. 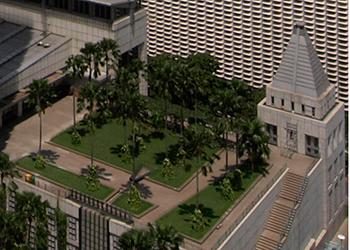 To be the leading Property Investor, Developer and Manager providing superior products and services. To provide quality and environmentally sound Property Development and Management to create added value for all stakeholders. 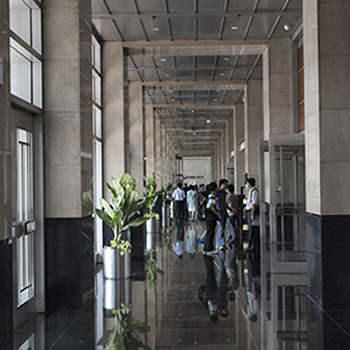 On May 19, 2011 PT.Grahaniaga Tatautama achieved Green Mark Gold Certificate for Existing Building, the first in Indonesia from the Building and Construction Authority of Singapore and later in 14 February 2015 awarded the Green Mark Platinum. Acquisition of this platinum certificate after going through the process more than 1 year to apply the 40 criteria including job Retrofit standard equipment in order to achieve energy efficiency and water usage. The use of new water sources (rainwater utilization, water condensation AC); and the reduction of organic and inorganic waste segregation; utilization of organic waste into fertilizer plants; enlarge the capacity of rain water infiltration to the ground; install roof garden on the 29th floor; application of sensors: motion sensors, CO, CO2, and Refrigerant AC; ensure the quality of indoor thermal comfort quality. 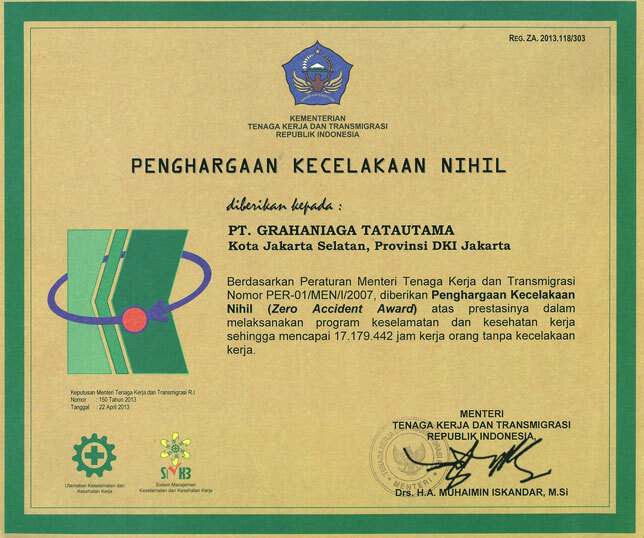 On May 26, 2014 PT Grahaniaga Tatautama (GNTU) received the Zero Accident national level presented by the Minister of Manpower and Transmigration Mr. Drs. Muhaimin Iskandar MSi as Trustees of Labor Occupational Safety and Health (K-3) National Level in 2013. On Wednesday, March 19, 2014, PT Grahaniaga Tatautama received the K3 trophy (Occupational Health and Safety) of the Dept. of Manpower and Transmigration presented by Drs. Priyono M.Si and Supervision Director Norma K3 Coaching Supervision Directorate Gen. and job Manpower Employment Mr. Ir. Amri AK, MM. This award is a form of fulfillment of the criteria of the company during the year 2013 to the K3 program awareness and implementation of Law No. 13 th 2013 on employment and the implementing regulations of Law No. 1 th 1970 on safety. The Audit was carried out by a team of Manpower and Transmigration Institution of DKI Jakarta. Simultaneously with the receipt of the award to the company , Mr. Fakky Ismail Hidayat, President Director of PT Grahaniaga Tatautama at Graha CIMB Niaga was awarded as Pemeduli K3. On10 April 2012 PT Grahaniaga Tatautama received renewal of the Certificate ISO 14001: 2004 Certificate, followed symbolically by planting 6,000 mangrove seedlings by the executive management of PT GNTU for coastal areas of North Jakarta and surrounding areas as part of Corporate Social Responsibility to help overcome the threat of coastal erosion in the area. In line with renewal of ISO 14001-2004, several attempts have been made including the management of clean water by developing alternative sources of water, waste water recycling, storage and disposal procedures of domestic garbage and hazardous and toxic waste, composting of organic waste in the surrounding environment, placement of bicycle parking for bicycle community and the fulfillment of air quality standards indoors. 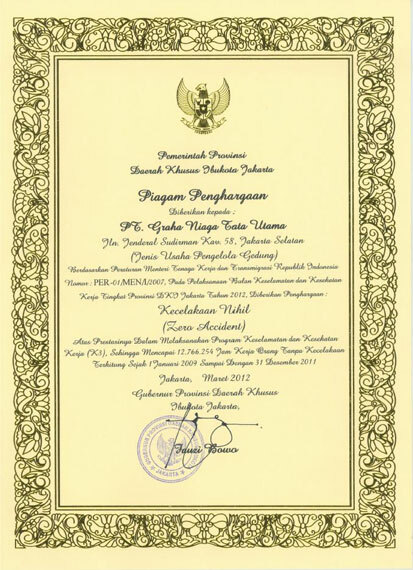 On 5 April 2012, PT Grahaniaga Tatautama (GNTU) received the Zero Accident and K3 trophy K3 in which the awards were presented by the Deputy Governor of DKI Jakarta Provincial Level I for Trade, Industry and Transport. The K3 awards are granted to the Company who regularly performs maintenance/repair operations of equipment and annually inspected by the Department of Labor and Transmigration Jakarta with recommendation GOOD. Inspection equipment includes Gondola, Elevator, Escalator, Generator, Electrical Installation, Installation of Lightning Distributors and Pressure Vessel. While the Zero Accident granted to the Company that its employees have no loss of the Working Hours for 2 x 24 hours due to fatal accident. Since 2006, GNTU already formed the Executive Committee to implement K3 related to the Occupational Safety and Health work where the Chairman and members welfare are equipped with Training and Seminars Expert for K3 General, K3 Electric Lift and others. 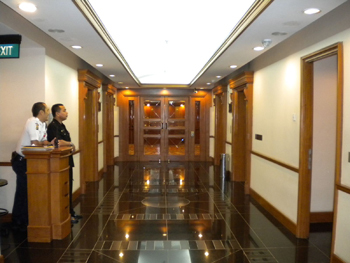 The K3 program is routinely performed for tenants including dissemination of emergency and evacuation drills. Employees do frequent counseling and medical examination. To provide comfort and health in the work space and the environment, GNTU periodically conducts air quality tests inside / outside the building, noise, lighting etc. 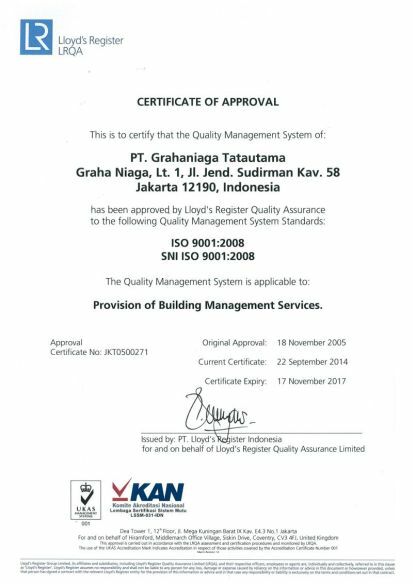 PT Grahaniaga Tatautama successfully obtained the renewal (Renewal) ISO 9001: 2008 from Lloyd PT Registered Quality Assurance (LRQA) up to 2017. This means that the company continues to maintain consistent and implement international standards of quality management, continuous improvement and makes this system a means of improving the quality of service to the Tenant. The Tenant Satisfaction Survey conducted annually by the company is one method for measuring and improving service levels.Each 6 (six) months LRQA conducts Oversight Audit to see consistency and improvement of what has been and will be carried out by the company. 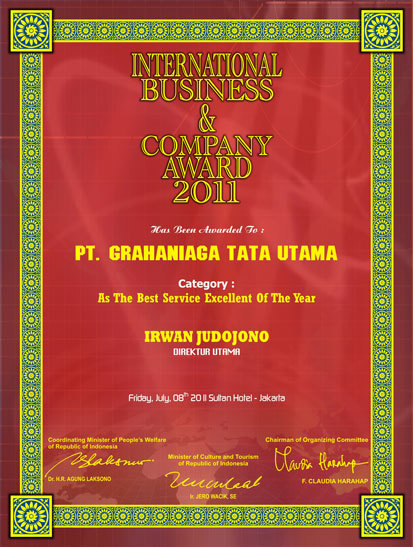 On July 8, 2011 PT Grahaniaga Tatautama awarded "AS THE BEST SERVICE EXCELLENT OF THE YEAR" in the event INTERNATIONAL AND COMPANY AWARD 2011 from the Central Institute Achievement Indonesia cooperate with ENTREPRENEUR INTERNATIONAL ACHIEVEMENT well as the Ministry of Government Affairs. 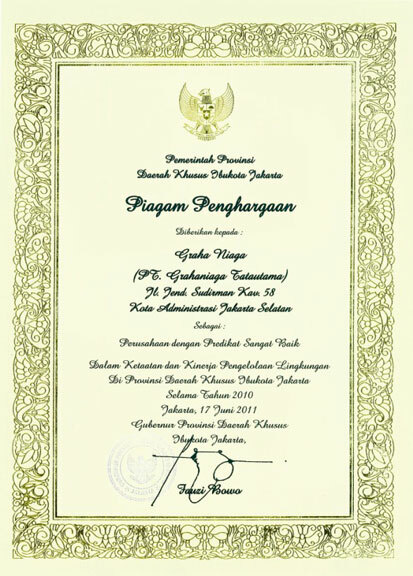 This award plaque was signed by the Coordinating Minister for People’s Welfare and the Minister of Culture and Tourism. 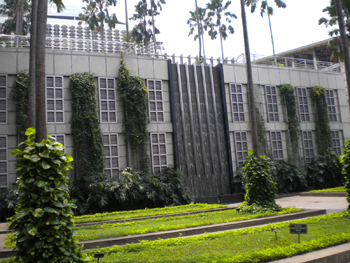 On June 17, 2011 on the Environment Appreciation night at the Great Hall of the City Hall in order Anniversary of Jakarta to 484, PT Grahaniaga Tatautama was awarded by the Building Environmental Management "Very Good" for the 3rd time bythe local government of DKI Jakarta. 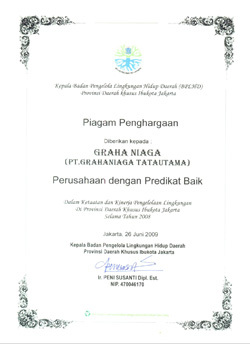 In 2009, PT Grahaniaga Tatautama received Charter Award from the Head of the Regional Environmental Agency (BPLHD) Special Capital Region of Jakarta as the Company for Settings and Environmental Performance business in the province of Jakarta Special Capital Region during the year 2008. This indicates that PT GrahaniagaTatautama is very concerned with the implementation of environmental management activities, for example controlling wastewater, air and solid waste utilization / domestic good. This concern is a step towards Green / Environment Building recognition. Grahaniaga Tatautama gives its gratitude to all the tenants, employees and all other parties who have work together with us. 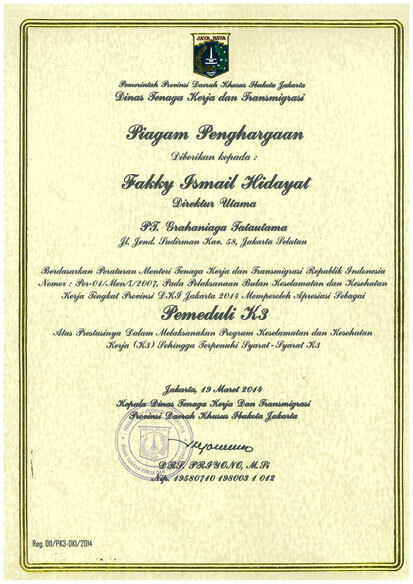 Because of the excellent cooperation from all, GrahaNiaga has able to receive, not just one, but two awards in the same time given by the Governor of DKI Jakarta Province. 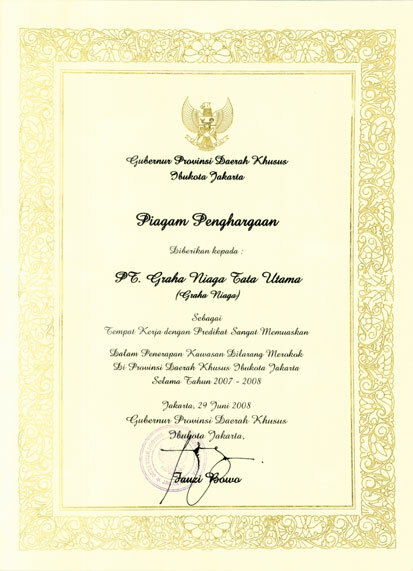 On June 29th 2008, the Governor of DKI Jakarta Province, Mr. FauziBowo, gave the award to PT. 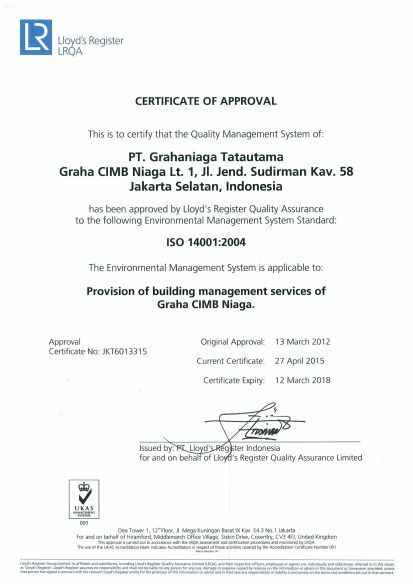 Grahaniaga Tatautama as a company with excellent compliance and performance in their environmental management for DKI Jakarta on the year 2007. The second award that was given at the same time is for its establishment as a workplace with excellent compliance for the application of non-smoking area in the DKI Jakarta Province for the year 2007-2008. These awards are the fruition and pride for all of us, because it would not be attainable without the great participation from everyone. The Management Team has extensive experience in property development and management. 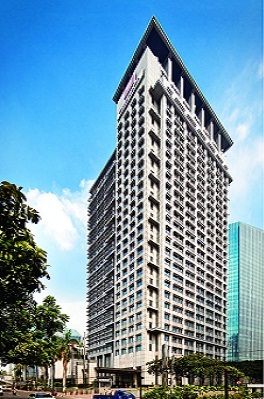 Strategic location, located in SCBD - the heart of Jakarta CBD ,surrounded by prime office, major shopping centres, 5 star hotels , entertainment centres and sport complex area. Easy access, it can be reached from major arterial road Jl Jend Sudirman and Jend Gatot Subroto and free from 3 in one policy through access from SCBD. 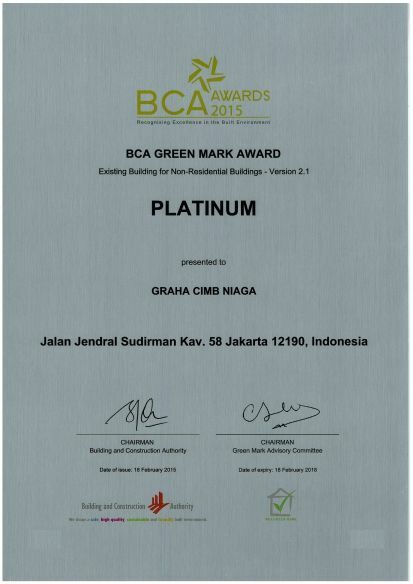 Green building recognition, living harmony with nature , PT Grahaniaga Tatautama is commited to develop “green development” and has been awarded a green mark platinum by BCAI of Singapore. 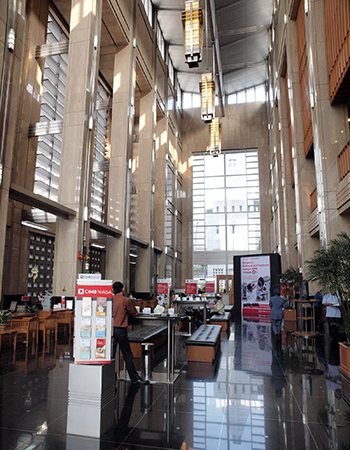 Complete facilities and features, Graha CIMB Niaga has an array of facilities and features from restaurant, medical clinic, food court, bank, fitness centre, financial club, financial hall with an open garden –one of its kind in Jakarta office. Service excellence, committed to provide the best service to our client / ftenants.